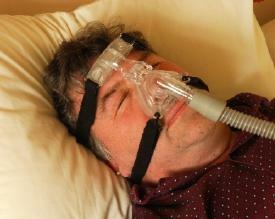 Read about other CPAP supplies. Standard pillows do not accommodate many Continuous Positive Airway Pressure (CPAP) and BiPAP users, so you will need to find a CPAP bed pillow to support you and your mask. To find the right pillow, you will need to know your sleeping patterns and the type of mask you use. Rest assured, LovetoKnow has taken the guesswork out of finding the perfect pillow. Now, you can minimize mask leaks while you sleep in comfort. The overall success rate for CPAP primarily depends on the proper use of the CPAP machine and wearing of the mask, so it is important to have the mask stay in place throughout the night. If air leaks occur or you disrupt treatment on your own, your condition could worsen. To avoid this, you need a stable platform while you sleep so that you have enough space allowance for the gear, and you have support for your upper body and spine. A CPAP bed pillow will give you this type of platform. Some CPAP pillows have hallowed spaces to support and protect your gear whether you have an over-the-head tubing mask, full-face mask, or nasal mask. Other pillow designs offer more flexibility in adjusting the pillow for your comfort while still giving you the space you need. You may have to try different pillows and use different strategies to find the perfect CPAP pillow, but for most users the specialty pillows offer more comfort and support over the use of standard pillows. The PaPillow has two distinct sizes and shapes. The larger double edge size offers flexible support for all types of sleepers, but it is especially helpful for stomach and restless side sleepers. This pillow design has a polyester fiberfill and comes with a machine washable cover. This type of pillow offers support for your mask and body no matter what position you start or settle into. The mini edge PaPillow is a smaller size, which is great for travel. The design also helps elevate pain or discomfort for those who sleep with a mouthpiece. Convenient for naptime and comfortable enough to use in any chair or lounge area. CPAP Multi-Mask Sleep Pillow is made of cushioning foam for your neck support. The curvatures in the pillow provide stable positions for your mask. It is the least complicated contour pillow out of the others available for CPAP users because it has hallowed spaces providing the necessary mask stability. This allows you to easily switch from sleeping on your right to left side. SleePap Pillow is a comfortable pillow, designed for both left or right side sleepers with spaces cut out to extend the mask over the edge of the pillow. This five inch pillow is excellent for side sleepers, and nimble enough to allow you to renegotiate the allocated spots for the most comforting fit. Slightly smaller than a standard pillow, there is more room available on the bed and next to your pillow for additional equipment and adaptors. Medicare does not cover CPAP pillows. It will cover the nasal pillow masks, but not the pillows that support the masks while sleeping. Those with a Medicare Advantage plan may want to contact your provider to ask if they cover this. Some Medicare Advantage plans cover additional costs or offer additional benefits over the Original Medicare plan. Private insurance companies may cover the CPAP pillow, but coverage from each carrier can vary. Contact your insurance carrier to ask about medical supplies covered under your plan. Some plans offer a small stipend each month to cover additional medical supplements and supplies. Sometimes a CPAP pillow may not be enough support when used alone. Use a trial and error method or combine approaches to make your therapy a success. Ask your doctor if you need a prescription for a different type of CPAP mask. Consider ordering a longer tube so it allows more room for changing positions in bed, without changing the position of the mask. Most users find that a longer tube allows more freedom, especially for those who are restless sleepers. Try new sleeping positions such as sleeping on your back even though you are stomach sleeper. Consider using a wedge pillow if you are a restless side sleeper. This way, you will not be able to toss and turn throughout the night as easily, keeping your mask in place. A wedge pillow will elevate your head with may also open your airway, making it easier to sleep and alleviate snoring. As CPAP users adjust to their gear, it can be a while before both spouses get a good night's sleep. Contact Alert Well And Keeping Energetic (A.W.A.K.E.) a support group for those with sleep apnea and their families.